While perusing a digest on LinkedIn, I came across a link to a Gallup report entitled “State of the American Workplace 2013” (http://bit.ly/1RQ5Bpa to register and download.) 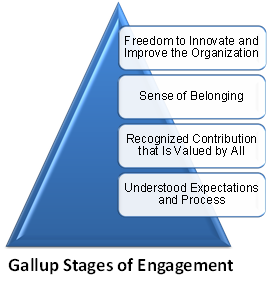 This is an informative report that establishes a quantitative value for employee engagement. When measuring employee engagement, the companies in the top quartile reported 22% more profit, 41% fewer defects, and significantly lower healthcare costs than the bottom quartile. Of America’s roughly 100 million workers, 30 million are engaged, 50 million are not engaged, and 20 million are actively disengaged. Actively disengaged workers sabotage, obstruct, and steal to act out their unhappiness and cost the US economy $450 to $550 billion annually. Of the industry sectors measured, manufacturing has one of the lowest levels of engagement, customer service is the job function with the lowest engagement, and Connecticut has one of the highest levels of actively disengaged employees. The bottom line is that an unpopular supervisor may be costing you a lot more than you think. Tie Employee Goals to Vision and Strategy: First of all, make sure you have a vision and strategy that employees can read and understand. All employees realize fulfillment by feeling connected to a mission that is valued by their community. Sense of mission is the most fundamental and necessary element of engagement. It used to be common wisdom to treat all employees equally. Today, great managers recognize the diversity of their team and tailor how they approach team members to satisfy individual engagement needs. For some, a sense of belonging may be essential; for others it might be mission. The ability to connect with employees needs to be balanced, however, with an objective accounting of results and helpful feedback. Flexible Work Rules: Employers that accommodate employees’ needs outside of work grow employee engagement. The Gallup data shows that remote workers had higher engagement and worked more hours than in-house employees. Of note, employees who were permitted to work less than 20% of their time remotely had significantly higher engagement scores than both the in-house and 100%-remote employees. Invest in Employee Development: Anyone under the age of 50 gauges their loyalty to an employer by the employer’s willingness to create opportunity and develop careers. Millennials comprise over 30% of the workforce today and perceived lack of advancement opportunities is the #1 reason for changing jobs. This is just a sampling of ideas. Please share any tactics that have worked for you or examples of employers who are great to work for. Wish you every success in the new year!